The principal goal of Research, Development and Engineering efforts is to provide integrated solutions that satisfy customer needs. Overall R&D efforts fall into two broad categories: 1) R&D of Individual capabilities or technologies and 2) Integration of these capabilities. Capability R&D includes advancement in technologies, manufacturing processes, engineering tools and quality control processes. Capabilities provide the foundation for delivering products and solutions. Capabilities R&D tend to be longer term efforts characterized by smaller teams that focus on progressing the state of the art, developing new discriminators and generating new intellectual property. Capabilities are generally reused used across multiple product lines. 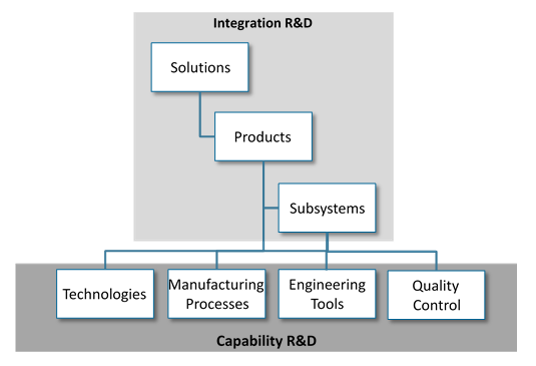 Integration R&D efforts include integration of constituent capabilities into subsystems and products. Integration R&D also focus on combining products into coherent solutions that satisfy customer needs. Integration efforts need to account for interdependencies between different capabilities and are characterized by larger teams focused on eliminating risks and launching new products and solutions. Complex interdependencies: Changes in one R&D effort may have a cascading impact on many other interdependent efforts. Disciplined R&D planning is needed to synchronize development of diverse interdependent R&D efforts. Diverse timelines: Different types R&D efforts have different development cycles and delivery time frames. These root causes are amplified in products with complex supply-chains and partnerships. Lack of integration manifests itself in product delays, late requirement changes, surprise issues and unexpected risks. So, what is an effective solution? Focus on Integration. Traditional R&D planning and management processes are quite effective for technology or capability development. For example, technology roadmaps are used quite pervasively and are successfully able to communicate broad technology plans. However, processes for managing integration of technologies are generally less rigorous. Phase Gate or Waterfall development do not include integration until the end of design phase. Even when intermediate integrations are planned, they are rarely disciplined. Integration roadmaps are rarely used in most organizations. In fact, most roadmapping tools do not even included features to support integration planning. Disciplined and iterative integration can bring agile development to complex physical systems. Integration plans help organization get better visibility into costs or risks introduced by smallest of changes. For example, changing the welding process on a small component may result in changed system efficacy or need for new V&V testing or expensive system re-certification. With adequate visibility, organizations are able to forecast resource requirements or allocate resources. Iterative development with frequent integration can also accelerate innovation delivery. Disciplined intermediate integrations mean stakeholders (executives, marketing, customers, partners, etc) are have clear understanding of the implications of their design decisions: Resulting in fewer late changes and improved organizational alignment. Also disciplined integrations mean incompatibilities and interdependencies are explored earlier – reducing surprise risks.